Craftster.org bit me with its swapping bug back in 2005. Although I had delirious fun crafting and acquiring several amazing handmade items, after a disappearing partner or two and life making its random demands, the virus eventually lay dormant. It wasn't until the marvelous Carapace suggested a holiday swap between the chatty FAE of the Fantasy Artists of Etsy street team monthly thread that the fever flared up again! I was given MissGnomer to shower with fairy goodness! After reading her favorite colors, I gathered up several products featuring every drawing I'd ever done in pink or purple. I also dusted off my knitting needles and made her a hip belt and cell phone cozy. Then I sent the package fluttering to Florida and flew off to Arizona. When I got back from gallivanting around in the desert, the most splendid treasures from the sea were waiting to welcome me home. 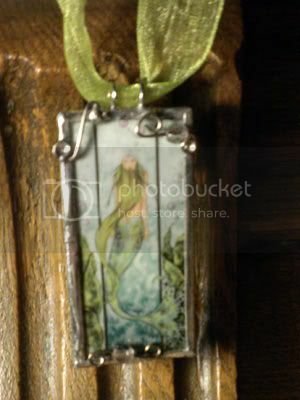 I have been dazzled by quite a few items dreamed to life by Julie of Mermaiden Creations. Her eclectica of unusual jewelry, bewitching hats and whimsical wonders is captivating. I was practically turning cartwheels when I realized she was my secret crafter. Although, to be fair, I would have twisted and twirled for any of the participating FAE swappers - they're all so fairy talented! I am delighted to be a part of the FAE team and know such amazing souls. I hope they're all able to participate in another swap next solstice. My photos don't nearly give Julie's glorious works of gleaming glass and solder justice. The pendant looks so pretty hanging from the ribbon she enclosed, I'm torn whether to add it to a chain to wear or just leave as is and make all the other ornaments dangling around my room jealous. 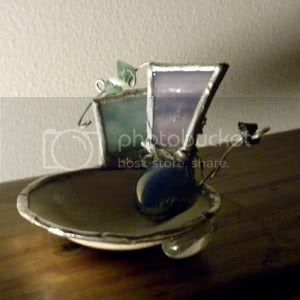 And the shell jewelry holder is genius! I feel like an underwater princess every time I drop a pair of earrings onto it. Thank you so very much, darling! I have *got* to get some good pics of me in Meri's lovelies.